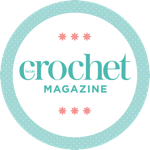 Inside Crochet readers the chance to win a set of five of her pretty geometric pastel heart stitch markers, worth £8.50. Check out her website at www.makeeshop.com, where you’ll also find patterns for gorgeous makes, from a moon bag and boho tassel tote, to a granny pom-pom pyjama bag and the cutest accessories for kids including elf slippers, a little heart bag and pixie hats. Also, look out for beautiful designs from Emily in upcoming issues of Inside Crochet! For your chance to win, visit our competition page.